From time to time, it’s nice to look back at some of the articles in our archives (currently over 12,000 items!) For All Souls’ Day, here is a great piece about black vestments posted by our founding editor Shawn Tribe in November of 2005, when NLM was less than four month old. This was a year and half before Summorum Pontificum, and I think it is probably not too optimistic to think that opposition to the use of black vestments has weakened even further, now that more people will have used them in the EF Requiem Mass, where they are mandatory. Often black vestments have been excluded in practice (though not necessarily in law) -- enough so that there are entire generations who will have never seen a black vestment worn, let alone know of its existence as a liturgical colour. For example, in the modern rite, red is now worn on Good Friday instead of black, which is still used in the classical rite of course. White will typically be worn for funerals. Sometimes purple will be used. Now let us get it straight: this is not a liturgical abuse as these are options which the Church has given, or in the case of Good Friday, changes that have been made. There are some, however, for whom this is not simply aesthetic (nor should it be), nor a question of common practice in a diocese, but is actually an ideological opposition aimed at the perceived “negativity” of black. This latter idea is a problem. I wish to address in a roundabout way both the problem with the former way of thinking, but also I want to make a case for why I believe the effective disappearance of black is not desirable, even when we are just exercising another legitimate liturgical option as a norm. The use of black is representative of some fundamental Christian realities. While Christians are a people of hope (the oft used argument for those wishing to exclude black), we are also a people aware of the reality of sin and judgement. We do not presume to know the state of our loved one’s soul. Too often even some parish priests themselves acquiesce to this idea that our achieving of our heavenly reward is a fait accompli. While we indeed hope and pray that our loved one has attained his or her heavenly reward, it is not a hope that is without reservations or loving concern. As Christians we are hopeful and yet also have a humble realism. We know that we are sinful creatures and we do not always meet the mark, nor necessarily repent of our sins. As such, we both hope and pray. Black, with its echoes of mourning and reserve, both acknowledges our own emotional response to the loss of a loved one, and is further representative of our need to pray for the repose of our loved one’s soul. It also is a reminder and symbol of our belief in Purgatory wherein the suffering souls require our prayers and especially Masses. 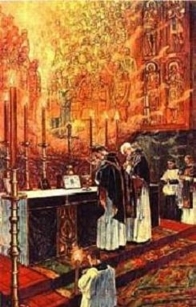 After all, Requiem masses are not merely memorials made for the living -- tools for our psychological and emotional comfort -- but are first and foremost powerful prayers and graces for the repose of our dearly beloved. If we approach the afterlife of heaven as “automatic” or as a given, who will take seriously the need to pray for the souls of Purgatory or our departed loved one? Eventually, who will see the need to have a funeral Mass? Black represents our mourning and also that there is work yet to be done -- the work of prayer, the graces of the Mass. The gold or silver which adorns the decoration of a black vestment gives us that silver-lining of Christian hope which we have for the resurrection of our loved one, and eventually ourselves, into Our Father’s House. There really is nothing to stop a priest from re-introducing black vestments into the sacred liturgy when the rubrics allow for it -- and this I would heartily recommend to parish priests who read this weblog. That being said, I receive many emails from readers on this weblog asking advice on how to approach such questions in there parishes. Often they are facing situations where there is little interest in the liturgy, or at least, little interest in the goals of the reform of the reform -- which may go in an opposite direction from where their parish is heading. In such instances, getting black vestments re-instituted may be a non-starter with their parish clergy -- but as I say, there is a surprising openness to them from many of the younger clergy. If you don't have that situation, don’t worry, there may yet be hope. While you may not get black vestments instituted in your parish, there is another option that comes halfway at least, and may be more acceptable in such a situation and would help begin to restore this balance of hope, mourning and prayers for the dead. 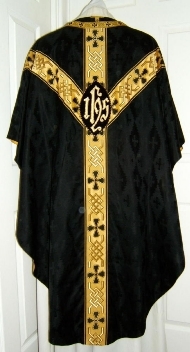 Here is my proposal for a pastor that can’t yet (or won’t) re-institute black vestments: a white (or preferably off-white cream colour) vestment, with a large, substantial band of black brocade going up the centre of the vestment -- or also with the traditional Y-orphrey. The key is making the black noticeable.